Winter is coming. To Game of Thrones-y? LOL – OK, OK. But the chill in the air is real, and nothing beats cuddling up in your favorite soft scarf with a hot mug of hot cocoa. 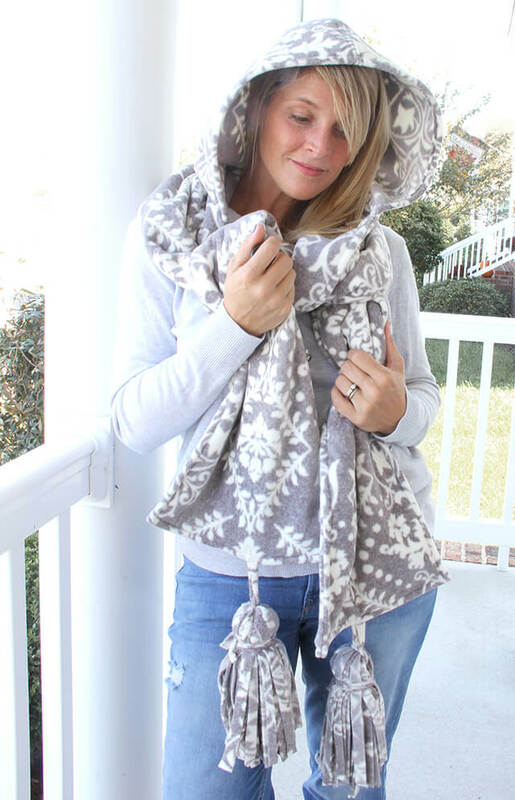 The women’s hooded fleece scarf pattern is perfect for just that! With its long sides, you can choose to wear this scarf dangling for maximum style, or wrapped around your neck for maximum warmth. Either way, it makes the perfect handmade holiday gift for your Mom, sister, brother, Father, Grandma…or just about anybody on your list. 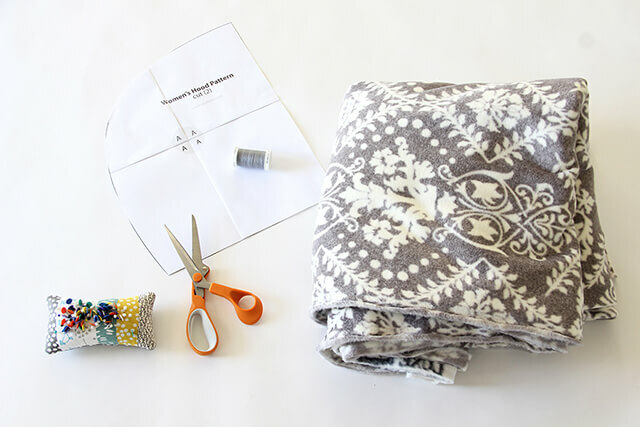 So download the free hooded scarf pattern below, pick up your favorite luxe fleece, and let’s get sewing! *Be sure to check out the new luxe fleece fabric available at Jo-Ann Fabric & Craft Stores! It’s amazingly soft, with a higher density and quality superior to regular fleece. I used it for this hooded scarf, and couldn’t believe how soft and luxurious it felt. 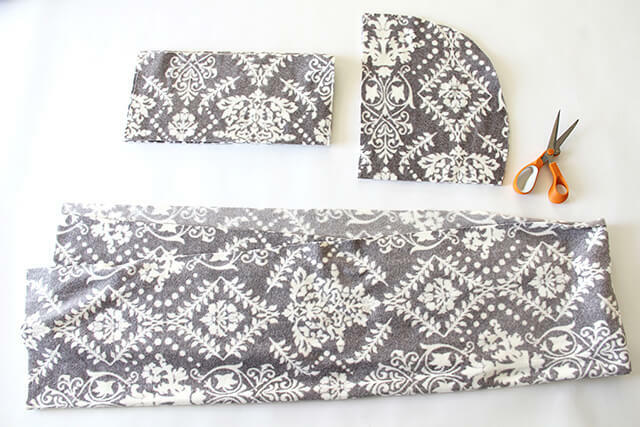 So grab your 40% off JOANN Fabric & Craft Stores coupon, and try the new luxe fleece for this project! 1. Download and print out the pattern, making sure the printer settings are set to ‘no scale’ prior to printing. Assemble pages as indicated, matching the center ‘A’ circle and taping together the pieces of paper at the gray border. Make sure the test square is correct prior to cutting any fabric. 2. Cut out the hood pattern as indicated. 4. Place 2 hood pattern pieces right sides together, matching up all outer edges. Pin outer curve and sew. 5. When sewing fleece, I always like to flat fell my seams. To do this, simply open up the seam with your fingers and edge stitch seam in place on either side to secure. 6. Fold the front of the hood opening ½” towards the wrong side and pin in place. Sew to secure. *Please note – if the regular fleece is used (not luxe fleece), you may want to line the hood. To do so, simply sew a lining exactly as we just sewed the exterior by repeating steps 4 & 5. Then simply slip one hood inside of the other, right sides together matching up the seam. Pin and sew front hood opening together. Turn right side out, and edge stitch around the hood opening to secure seam in place. Baste stitch the bottom raw open edge together to secure. 7. Place (2) of the 17” x 8” rectangles on top of each other. 8. 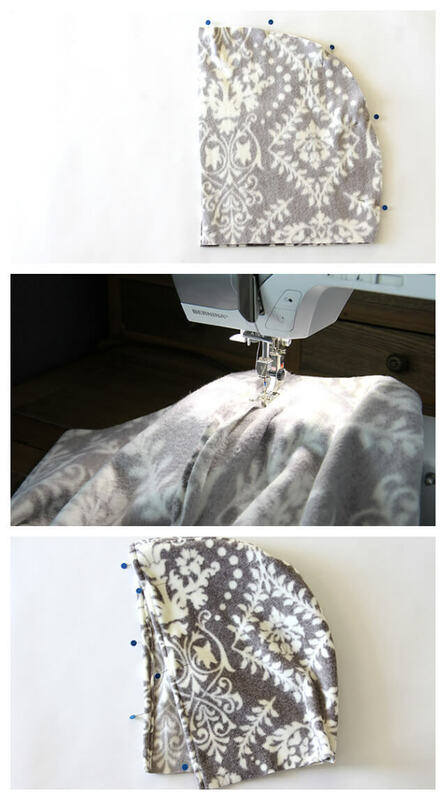 Using a rotary cutter and ruler, cut strips of the fleece along the entire rectangle ½” wide x 17” long. 9. Set 2 strips of fleece aside. 10. Gather the center of the strips of fleece, and slip one of the strips underneath the center. 11. Tie a knot around the gathered strips to secure. 12. 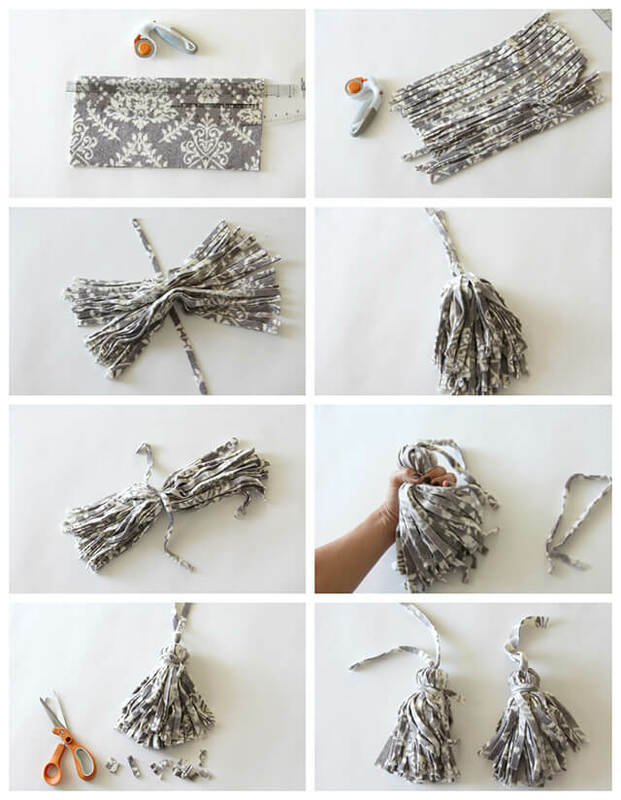 Using your hand, make a circle around the tassel bottom, 1.5” down from the top. 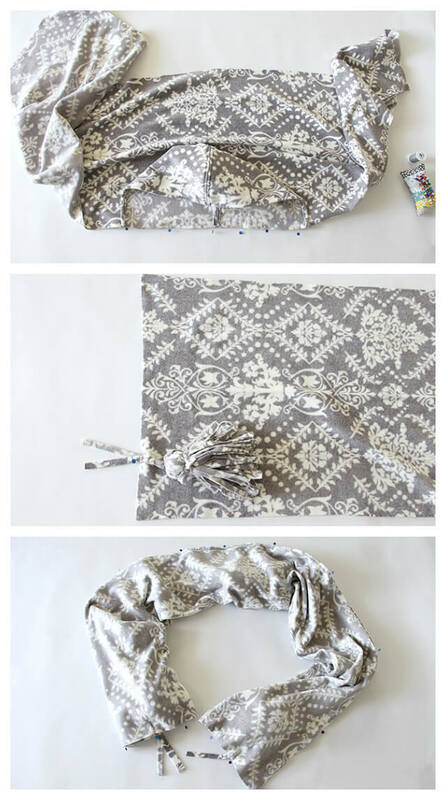 Use the other strip of fleece to tie a knot where your hand is. 13. Trim the excess fleece tassel bottom evenly. 14. Repeat for other (2) rectangles to make the other tassel. 15. Determine the center of the long 72” edge of the scarf fabric. 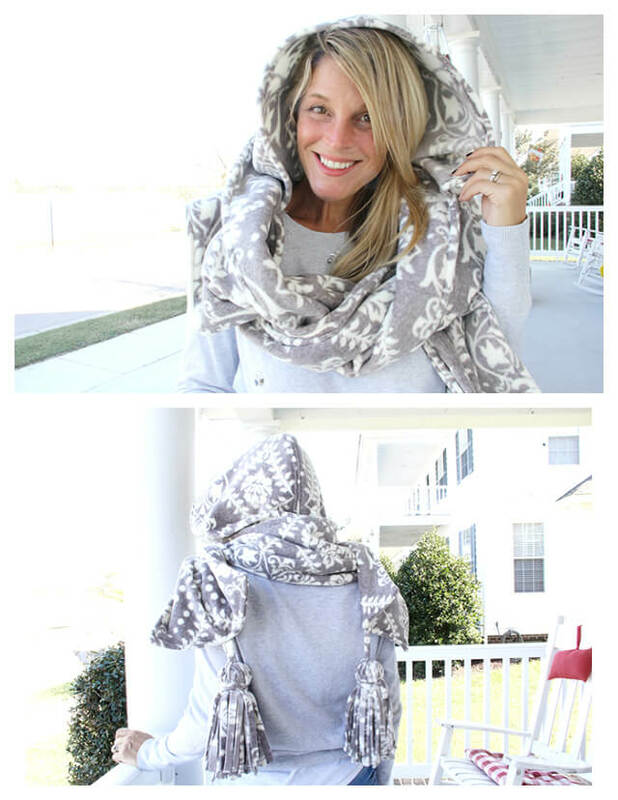 Pin the bottom hood seam to the center edge of your scarf. Pin the hood bottom on either side of the center, until the hood bottom is fully pinned to the middle of the scarf. Sew to secure. 16. 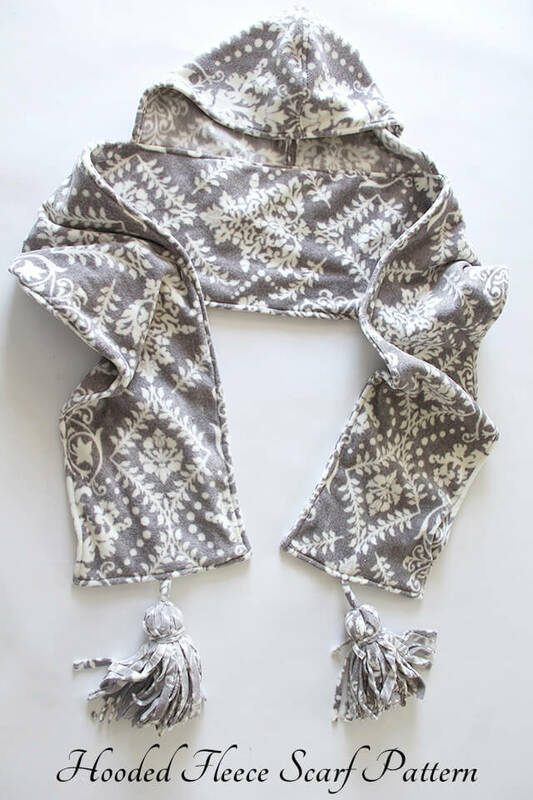 Along the side shorter edge of the scarf, pin the top tassel strips one-quarter up from the edge. (Measure the middle of the side edge, and then the middle between that center point and the edge. This is the quarter mark.) Sew tassels back and forth to secure. Repeat for both sides. 17. Fold scarf in half, right sides together, matching up the long outer edge. Make sure the hood is in the middle, as well as the tassels. Pin around, leaving a 12” opening for turning. Sew. 18. Turn scarf right side out through the opening that you left, and push out all edges. 19. Pin opening closed, and edge stitch around the entire outer edge of the scarf to finish.